Q: How can I order a Terrace paver? To order a Terrace paver visit terracepaver.org to submit your order online or to print an order form. Email unionalumni@union.wisc.edu to request an order form via US mail. Q: What paver sizes are available? Q: What is a shared paver? A shared paver is half of a 12" x 12" paver. 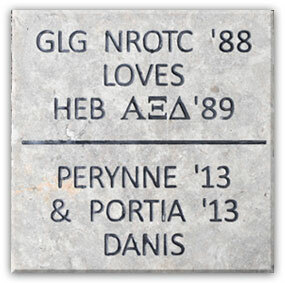 The inscription will be on the same paver with someone else who ordered a shared paver. There will be a line separating the two inscriptions. Q: I purchased a 6" x 12" shared paver. Can I share my paver with someone specific? Yes. Email unionalumni@union.wisc.edu with your name and inscription and the name, email and inscription of the person with whom you would like to share your paver. Q: What can I engrave on my paver? Each paver size has a maximum number of characters allowed per line. You can personalize your paver with your name, recognize a family member or use a quote that is significant to your time at the UW. All inscriptions are subject to approval by the Wisconsin Union. Q: When will my paver be installed? Paver installation will occur each spring. The next round of pavers will be installed spring of 2018. Q: Will I receive confirmation of my paver order? Yes. When the Union receives your paver order, a confirmation email will be sent to the email address included in your order. You will have 10 business days to make any changes to your inscription. If you do not receive a confirmation email within two weeks of placing your order, please call (608) 890-1736. Q: How do I find out where my paver is located? Upon paver installation next spring, you can go to terracepaver.org and use the paver map to locate your paver. Q: Where will my paver be placed? May I choose the location? Pavers will be placed on the historic Memorial Union Terrace, outside the entrance to der Rathskeller. Due to the paver layout, we are unable to accept requests for specific paver locations. Yes, your donation is 100% tax deductible. You will receive a receipt for your records from the UW Foundation. Q: Can I order more than one paver? Yes! Email the paver sizes and inscriptions to unionalumni@union.wisc.edu. Visit www.supportuw.org/giveto/terracepaver to give your gift using a customizable form. Or, download and complete the paver order form. Mail the complete form with payment to the address included on the form. Q: This is a gift; can the recipient send in their inscription after the holidays? Yes. Inscriptions must be submitted within 30 days of the paver order. Inscriptions submitted after Jan. 31, 2018 will be added to the 2019 paver order. Q: How long will pavers be available? There are a limited number of pavers available. The Union will accept paver orders until all pavers are sold. Q: Can I mail in my paver order? Yes. Printable order form can be found here. Q: How do I change my inscription? You can change your inscription within 10 business days of placing your order. Email unionalumni@union.wisc.edu with the donor name, the date you submitted your order and the revision to your inscription. Revisions may not exceed the character limit of the purchased paver. Q: May I make a group gift? Gather payments from everyone in the group. Then, mail in the printable paver form with your inscription. Include a list of all donors with their names and addresses. Email your order to unionalumni@union.wisc.edu with the paver inscription and the names of everyone who contributed to the paver. Individual donors can give online at www.supportuw.org/giveto/terracepaver. This will allow you to customize the amount of your gift. *Your paver order will not be submitted until all payments are received. .
Q: My paver is damaged. Will I receive a replacement paver? The pavers are made of natural stone, and, therefore, you should expect normal wear and tear. The Union will replace any paver with damage that affects the inscription or if the stone becomes a hazard to Terrace-goers.